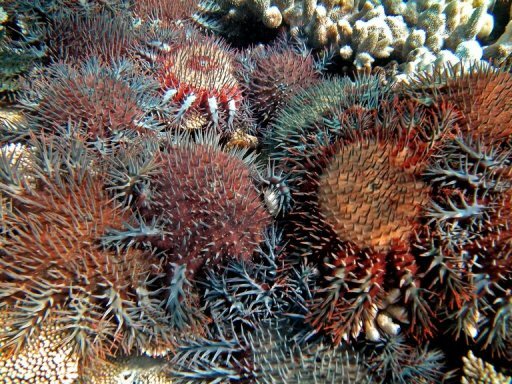 File photo of coral-eating starfish on Australia’s Great Barrier Reef, the scourge of which has been partly blamed on climate change. Australia’s new conservative government on Thursday abolished an independent climate change commission set up by the previous Labor administration, as part of its plans to streamline bureaucracy. SYDNEY (AFP) – (AFP) – Australia’s new conservative government on Thursday abolished an independent climate change commission set up by the previous Labor administration, as part of its plans to streamline bureaucracy. The Climate Commission was set up to provide apolitical and reliable information to the public about the science of climate change, emissions targets and international action being taken. But Prime Minister Tony Abbott’s conservative coalition, which plans to repeal Labor’s tax on corporate pollution and is the first post-war Australian government not to have a science minister, said an independent body was not needed and the role wouldscourge be assumed by the Department of the Environment. « As part of the coalition’s plans to streamline government processes and avoid duplication of services the commission’s function to provide independent advice and analysis on climate change will be continued by the Department of the Environment, » said new Environment Minister Greg Hunt. He said it would save the budget Aus$1.6 million a year in running costs. Climate Commission head Tim Flannery argued that there was a strong need for independent and accurate information on climate change as « propaganda » aimed at misinforming the public increases. « I believe Australians have a right to know, a right to authoritative, independent and accurate information on climate change, » he said. Australia, which is among the world’s worst per capita polluters due to its reliance on coal-fired power and mining exports, has just experienced its warmest 12 months on record. Average temperatures throughout the country in the year to August 31 were 1.11 degrees Celsius ( 2.0 degrees Fahrenheit) above the long-term average. Australia’s last summer — the hottest ever recorded — witnessed an unprecedented heatwave, bushfires and floods and Flannery, a professor regarded as one of Australia’s top climate scientists, said an informed public was key to action on climate change. Australia’s chief scientist, Ian Chubb, told the ABC this week that the axing of any climate bodies would be a loss. « These sorts of issues are not going away just because we ignore them, » he said. Abbott was only sworn in on Wednesday but he has already taken the axe to three high-profile public service department heads and merged government aid agency AusAid with the Department of Foreign Affairs to cut costs. He made clear on Wednesday that scrapping the carbon tax, which charges the country’s biggest polluters for their emissions at a fixed price and is due to transition to an emissions trading scheme next year, was his top priority. His government instead favours a « direct action » plan that includes an incentive fund to pay companies to increase their energy efficiency, a controversial sequestration of carbon in soil scheme, and the planting 20 million trees. Abbott, who once said that evidence blaming mankind for climate change was « absolute crap », ordered officials to immediately « prepare the carbon tax repeal legislation », despite a battle looming in the upper house.